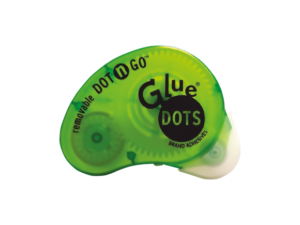 Easy to use Dot ‘n’ Go applicators, just press and roll. Use anywhere you need a quick bond. Bonds to virtually any surface! Each applicator has 200 dots, 6 applicators in a box. 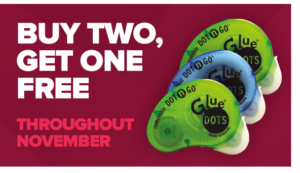 6 Handy applicators each with 200x 10mm diameter Removable adhesive glue dots, ideal for applying credit cards / CD’s to letter and magazines. 6 Handy Applicators each with 200 Permanent Glue Dots for sticky crafty projects, once stuck will not move! • Retail Repackaging • Printing • Direct Mail • Point of Sale • Fulfillment • Arts and Crafts. More than just a dot!